Since 2009-2010, the Integrated Electoral Assistance (IEA) has evolved from a general support strategy to a more specialized one that does not only take into account experience and competences already acquired by the Electoral Commission but also new needs. The IEA currently consists of around 140 staff. 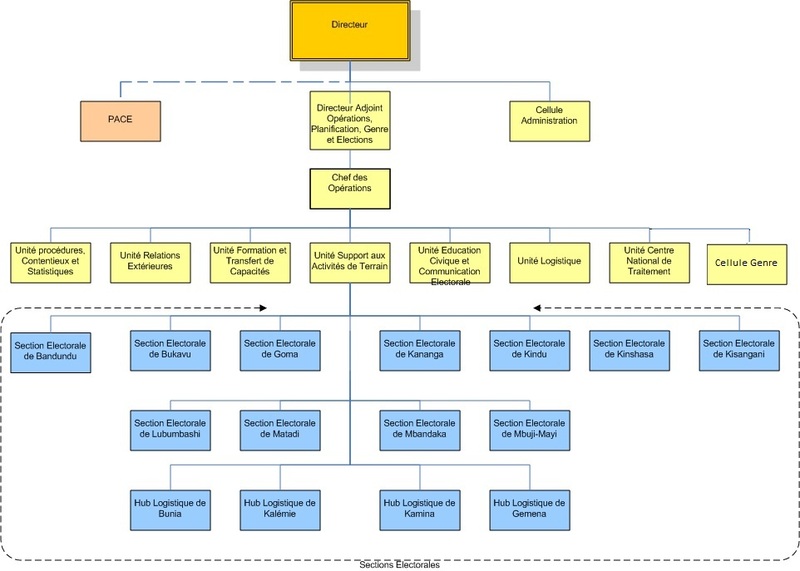 At the Headquarter level the Electoral Division consists of a director, 1 assistant director, 7 operational units and 11 electoral provincial sections. The Support Project for the Electoral Cycle (PACE) of the United Nations Development Program is managed by a Principal Technical Counselor (PTC) supported by an Operations team and 5 operational units. The project is managed through a Management Committee and a Technical Committee. The Management Committee provides the strategic direction and will be co-chaired by the UNDP Resident Representative and the Chairperson of the INEC. Representatives of the Development Partners who contribute to the basket fund, the INEC governing body, and MONUSCO, inasmuch as it will execute an electoral mandate, will participate to the Management Committee. The Technical Committee is composed of the “Governance” advisors of the Development Partners who analyze, discuss, and prepare matters to be submitted to the Management Committee. It meets weekly in the “pre-election and election” period and once every two weeks in “non-electoral” periods.